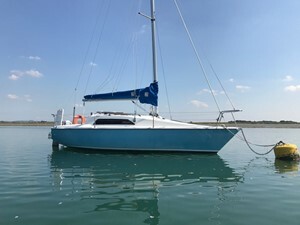 For sale is our Hunter Delta 25, lifting keel variant. Professionally restored by previous owner to a very high specification; new heads, electrics, 6Hp 2stroke outboard, gas/cooker, sails, running gear and road trailer, as well as a fully restored interior. I have sailed this boat for one season, but work commitments and a growing family mean that I won't have the time to sail her for the next few seasons. She sails beautifully on all points of sail, she can either take the family safely out for a sail, equally she will give any small racer a run for their money! The road trailer is 3 years old and is left jacked up when the boat is out, protecting the tyres and axles from undue load. I towed this boat from the west country to Hampshire and she tows very comfortably.